Informer is the customer magazine of Knorr-Bremse Systems for Rail Vehicles, the world’s leading manufacturer of brake systems for rail vehicles. Apart from brake systems, intelligent entrance systems, air conditioning units, control components and windshield wipers, the other product fields include platform doors, friction material and driver assistance systems. Knorr-Bremse also offers driving simulators and E-learning systems for the optimal training of train staff. 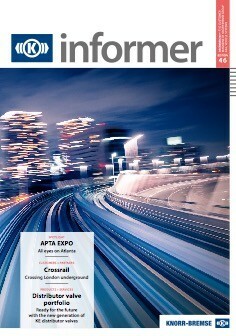 Informer informs about innovations and things worth knowing about the company and the sector. The main topics are Knorr-Bremse products and solutions as well as projects in Germany and other countries. The magazine is intended for customers, partners and interested persons from the industrial and services sectors – for example, operators, vehicle manufacturers, plants and workshops, as well as for politicians, scientists and consultants throughout the world. Informer is published three times a year in German and English.